SCOTTSDALE, Ariz. – The National Association of Chain Drug Stores has awarded $230,000 in scholarships and grants through its 2017 NACDS Foundation Scholarship Program. Announced during the NACDS Annual Meeting in Scottsdale, Ariz., this week, six grants of $20,000 each were award to applicants for innovative education programs, including two in the name of industry leaders: The Wayne Roberts Memorial Scholarship, provided by Apotex, and the Robert J. Bolger Scholarship, provided by Teva. Two one-time grants of $15,000 each also were given out for excellence in diversity programs. NACDS’ Kathleen Jaeger (left) and Steve Anderson (right) present an Excellence in Pharmacy Education grant to Henry Mann (center), dean of the Ohio State University College of Pharmacy. The NACDS Foundation selected this year’s recipients from more than 40 general and diversity scholarship applications, which were submitted from deans of accredited pharmacy colleges and schools nationwide. • Duquesne University School of Pharmacy, which will launch a study in an underserved area of Pittsburgh by providing patients with free hepatitis C virus screenings and education through a university-run outpatient facility. • Nova Southeastern University College of Pharmacy, which will provide pharmacy students with practice-based experience through its new Adherence, Transitions of Care and Medication Therapy Management Center, opened in 2016. • Ohio Northern University Raabe College of Pharmacy, slated to launch a two-year program to screen 1,000 underserved patients in rural Ohio for hepatitis C using a college-facilitated mobile health clinic. • Ohio State University College of Pharmacy, whose students will give refugees and new immigrants an understanding of the U.S. pharmacy and health care system by providing an introductory course on pharmacy services. • Union University School of Pharmacy, which will launch a study assessing educational intervention techniques in diabetes care for African-American patients at risk for diabetes-related health issues in west Tennessee. • University of Colorado Skaggs School of Pharmacy and Pharmaceutical Sciences, which will expand its program requiring students to travel and live for six weeks in a rural pharmacy location and work an with inter-professional health care team. Winning the two foundation’s diversity scholarships were the University of Texas at Austin College of Pharmacy and the University of New Mexico College of Pharmacy. The University of Texas at Austin College of Pharmacy will work with partner institutions, including two historically black colleges, to select 15 students to attend a one-week program to expose them to pharmacy school and the pharmacy profession. The University of New Mexico College of Pharmacy plans to select 15 racially and ethnically diverse students for a three-week “Pharmacy Readiness Bootcamp” to maximize their likelihood of academic success in the PharmD curriculum. 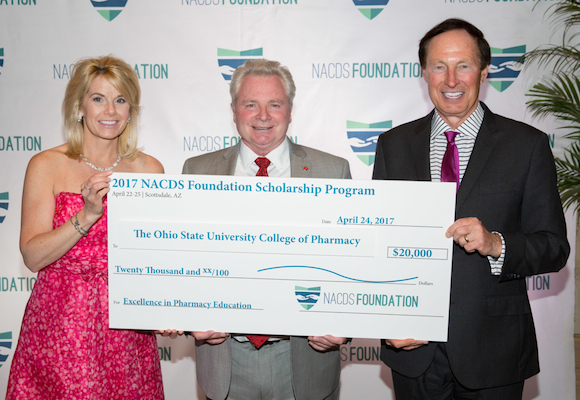 In place for two decades, the NACDS Foundation Scholarship Program has awarded nearly $4 million in scholarships for pharmacy education. The program is designed to fund prospective projects that hold promise to meaningfully improve patient care.